As Larry Dixon continues his quest to build the ultimate 9-second street car, the upgrade we will be covering this month has to do with passing gas. Yes I said it, and you can stop laughing at any time – I’ll wait. Anyway, when Larry and the guys installed the Chevrolet LT4 engine in his ’66 Chevrolet Nova, there were no off-the-shelf header options available, so they modified the factory manifolds. When Jim Browning of Ultimate Headers found out, he and Larry got together after Drag Week to come up with a plan to remedy that performance-hindering situation. Throughout Drag Week, Larry’s Nova was breathing through a set of cut and modified stock exhaust manifolds. He later found out they were choking 20 horsepower from the engine. In case you haven’t been following along with our coverage of Larry ‘s Nova build, he started by rebuilding the suspension with the help of Classic Industries, updating the fuel system, and installing a Chevrolet Performance supercharged LT4 engine. After that, he conquered Drag Week, and then installed a rack-and-pinion steering from Church Boys Racing. If you want to see everything that was done to the car, you can check out all of the articles by clicking here. Both stock manifolds had the factory collector flanges removed and collector tubes welded on to make the connection to the dual exhaust. The number five tube also needed to be notched for steering shaft clearance. The manifolds worked, but definitely restricted airflow. As previously stated, the LT4 was breathing through a set of cut and rewelded stock manifolds, and performance was surely hindered. We would be willing to bet that if Larry’s car had the Ultimate Headers installed for Drag Week, the Nova would have easily hit 10-second quarter-mile times. Since Jim and the guys from Ultimate Headers were willing to take on the task of building a proper set for the Nova, Larry’s car would certainly benefit. What’s more, now these headers are available for others doing a swap like this. That being said, the headers are not designed to fit in a car utilizing the stock steering system. Larry’s car has a Church Boys Racing rack-and-pinion steering system, and the design was initiated with that in mind. But building a set of headers takes more than just cutting some steel tubing and welding it together. Not only does it need to fit the car, but it also needs to improve engine performance as well. We don’t need to explain that header design has a significant affect on an engine’s performance, and is a crucial element in tuning an engine’s output. When discussing header design, the primary considerations consist of fitment, pipe diameter, and the length of the primary tubes. While the fitment is a must have piece of the puzzle, diameter and length can be adjusted to accommodate the fitment. These considerations will also be the determining factors of the location of the engine’s power band and the RPM location of peak power output. Each Ultimate Headers header is hand constructed, and made of 321-grade stainless steel. An engine’s power producing capacity, the number of cylinders, and the maximum usable engine RPM will influence the decision of what primary-pipe diameter and length to use. In a perfect world, the length of the primary tubes should be equal, but since that is not always an option, a variance of 2 inches or less is an acceptable compromise. Most stock exhaust systems fall short when it comes to supplying a sufficient flow of exhaust gasses at high engine speeds. Restrictions like stock exhaust manifolds, catalytic converters (if so equipped), mufflers, and the pipe connecting it all, play a role in the exhaust’s efficiency. When you increase the horsepower output of an engine, you will also see a proportionate increase in the amount of exhaust gas produced, placing added demand on the system. To help with exhaust-flow efficiency, Ultimate Headers designs and builds headers that – first and foremost – fit, and provide serious power gains by improving the efficiency of exhaust scavenging from the cylinders. Mock ups ready for final welding. If you’re looking for a set of headers for other Chevrolet engines like LS, big-block and small-block, the selection at Ultimate Headers is definitely worth checking out. Like many high horsepower engines, Larry’s LT4 needs to move a lot of air, so 1-7/8-inch primary tubes are made of 321-grade stainless steel. This type of stainless is very durable, and also possesses excellent strength characteristics when exposed to high temperatures. By adding titanium to the mix when blending the basic nickel/chromium steel alloy, 321-grade stainless steel has proven itself to have increased resistance to material fatigue and thermal cracking. That is definitely a good quality for a header tube to possess. Another benefit is reduced header weight. Because of its strength at high temperatures, the tube’s wall thickness can be reduced, saving weight while retaining durability. The limited space offered in the engine bay when filled with the supercharged engine was another challenge that needed to be overcome. According to Browning, “We knew that a header like this with a very large radius would not fit into Larry’s car, so our engineered, stainless steel investment-casting bend, creates the turn exiting the chamber with a radius much tighter than other header designs. The investment casting also uniformly holds the desired wall thickness from end to end. The result is a more compact header, keeping the exhaust system in a narrower space.” That is how Ultimate Headers came up with the slogan Big tubes for tight places. Header collectors do more than simply connect the header to the exhaust system. Their design has a measurable impact on torque production. While the merging of a header’s primary pipes affects header tuning, it is header collector volume that alters torque output. 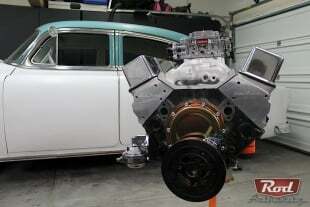 The collector used on the Ultimate Headers pieces in Larry’s Nova do not use a traditional three-bolt collector. Rather, these headers use a smooth collector with a special clamp designed to connect to the exhaust. The clamp is available with the needed O2-sensor bung. The Extreme Low Profile Clamp accomodates up to 13 degrees of pipe angle during exhaust connection, and uses a claw-style hinge. One end of the clamp is welded to the header collector (or any pipe for that matter), and the other connects to the exhaust. This style clamp creates a quick and easy-to-achieve connection. Dyno numbers don’t lie. These headers help make power. But the proof of the header’s ability to improve engine output needs to be quantified on the dyno, and the results that were achieved with the Ultimate headers is definitely substantial. Before the stock, modified exhaust manifolds were removed, the car was placed on the dyno and delivered 512 horsepower at the rear wheels. After the new headers were installed, that number jumped to 532 horsepower. To say the LT4 is breathing easier is an understatement. With the technical stuff out of the way, we were curious as to how well these headers fit, and if there were any “problems” that caused an issue during the install. 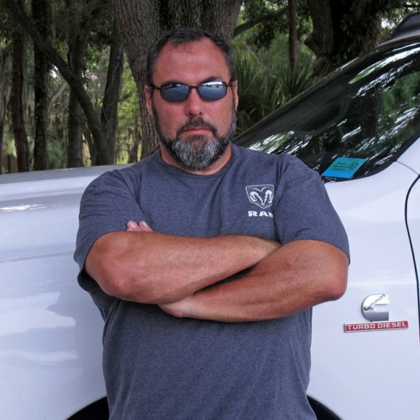 To find that out, we contacted Chuck Church Jr. of Church Boys Racing, because he was the guy that handled the install of the headers into Larry’s car. This mock-up image shows that it’s a tight fit, but both the passenger’s side (left image) and the driver’s side (right image) fit with no problem. Attention to detail is paramount at Ultimate Headers, and they have something to make your engine bay stand out at a show – a cloisonné badge. A cloisonné is a technique for decorating metalwork objects with a vitreous enamel. The badge not only adds another touch of bling to your engine, but lets everyone know that you’re running the ultimate headers. Now that you know the reasons why Larry chose to use Ultimate Headers in his ride, and what needs to be done to accomodate their fitment, maybe you should also check them out for your classic. Remember, they have headers for more applications than just an LT4 swap.